At this point it seems that CMS was the exclusive retail partner for SyQuest’s technology — although that would soon change. The name SyQuest didn’t show up in any early CMS publicity material; the company initially tried to brand the new device and its cartridge “CM-55” (The number referred to the unformatted capacity of each cartridge; in actual use of course the capacity was 44 megabytes and CMS’s first ads show a change to “CM-45.”) Nevertheless, SyQuest would become shorthand for the entire system, with that company’s logo appearing on nearly every cartridge sold. MacWeek predicted customer shipments for the CM-55 in December 1987, for an introductory retail price of $1,500 which would soon ramp up to $1,800 (!) for the drive alone. 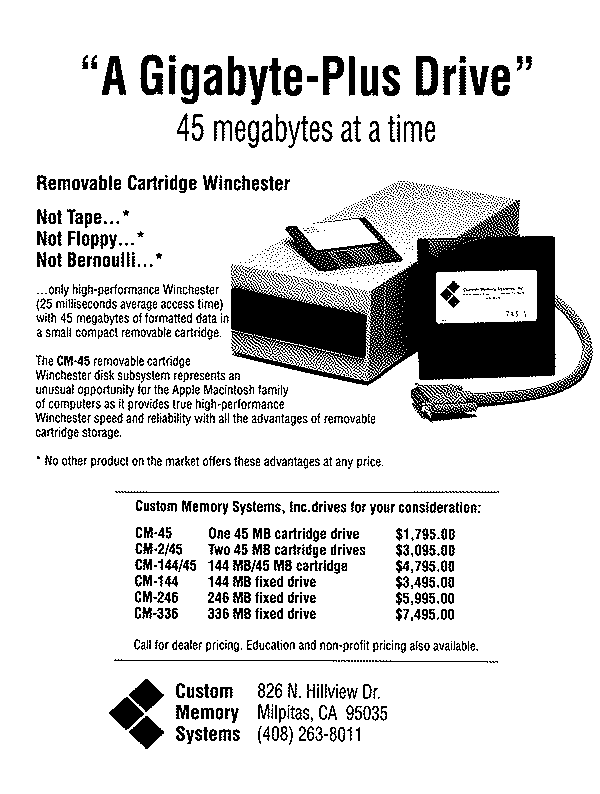 44meg (sorry, “55 megabyte (unformatted)” cartridges would be $125 each. In retrospect, these early prices seem astronomical — by the time the original 44mb system had hit its stride and achieved large scale deployment, drives would go for for $200 and cartridges $40. But what need would drive the success required for a successful transition from niche to necessity? In a word: the laser parlor. An essential (if now vanished) element of the 1980s Desktop Publishing scene, these retail operations offered walk-in access to high-end printing equipment that the average user could never afford. Although as time went on some offered professional-class imagesetters with dedicated outboard RIPs (raster image processors), in the early years many provided nothing more than access to an Apple LaserWriter Plus or IINT. The $5-$8,000 price point of these early laser printers — although inexpensive compared to even a few years previous — still rendered them inaccessible for the average freelance designer or page layout artist. (We are still a few years before the 1989 introduction of the HP DeskWriter and its democratization of pseudo-300dpi output.) So the solution was simple: take your PageMaker or Adobe Illustrator files into a facility where you could print out your work in high resolution, and perhaps have it duplicated at the same time for mass distribution. But in order to do that, you needed to fit your work on an 800k disk. Easy enough for a simple vector illustration, or a text-heavy DTP project. But what about large, multi-page projects with complicated EPS and large scanned TIFFs? And how to assure that the laser parlor would have the precise fonts you designed with — which, keep in mind, were licensed only to you? Juggling multiple floppy disks to dynamically reassemble a complex project, when laser parlors were charging by the hour as well as the page, would be frustrating and expensive. And in the days before a reasonably-priced laptop (the $7,000 Macintosh Portable cost more than a laser printer), bringing in your entire workstation would be a literal heavy lift. Enter the SyQuest cartridge. With 44 megabytes of space, even the largest and most complex desktop publishing project would fit, with room to spare for the outline and screen fonts, linked external TIFFs, precise version of PageMaker or Quark with all the needed plugins — even your own System Folder, if you wanted to boot directly from the cartridge itself. Years before the NeXT Cube and its magneto-optical drive would become widely available, the SyQuest 44mb system offered the real-world, affordable experience of what Steve Jobs promised in the introduction of that futuristic computer: bringing your entire data world with you in a portable disk. One of the favorite new toys of the Mac power-users with power-bucks are the 44 meg “removable media” drives. These are hard-disk drives with the hard-disk in a removable plastic cartridge. They are the 10-wheel truck of Floppyville. All of the hardware manufacturers are coming out with some form of these drives. D.P.I, MassMicro and Peripheral Land have been leading the pack with big ad budgets. Interesting is that David never mentions “SyQuest” brand name in his piece — apparently the large size of the removable storage (44MB) was a better descriptor than the OEM vendor of the actual mechanism. MacWorld magazine first mentioned SyQuest drives in the context of a Backup article in November 1988. Given print magazines’ lead times — and the complexity of an article that reviewed 50 separate products — it’s safe to say this also reflects a Summer 1988 timeframe for the transformation of SyQuest: from newly-introduced gadget to essential accessory.